Fauna & Flora International and Belizean partner Ya’axché Conservation Trust have commended a CITES decision to strengthen protection for tropical hardwoods, write Gail Stott and David Gill. Valuable but highly threatened rosewoods and ebonies have a more secure future after a historic decision at the recent CITES meeting in Bangkok. These trees produce stunning timber that is highly prized for musical instruments, veneers and high-end furniture, but populations have been decimated by unsustainable logging, and many species are now threatened with extinction. Delegates from 170 countries agreed to include over 80 ebony species (Diospyros spp),and over 40 rosewoods (Dalbergia spp) from a range of countries including Madagascar, Belize and Thailand on CITES Appendix II, meaning that international trade in their timber will be more strictly regulated. Throughout 2011, as international demand for precious hardwoods spiked, Fauna & Flora International’s partner in Belize, Ya’axché Conservation Trust, observed dramatic impacts on the country’s native rosewood species (Dalbergia stevensonii) and on the people and forests in the south of the country. When the rosewood crisis reached its peak in February 2012, the Government of Belize stepped in to place a moratorium on logging and exports to allow a re-assessment of rosewood stocks. It then took a series of strong measures to demonstrate its no-tolerance stance – including the burning of rosewood stockpiles. While these national measures provided temporary relief for Belize’s rosewood, the decision from CITES will aid international cooperation in regulating timber trade if and when the national moratorium is lifted. The CITES Appendix II listing requires exporting countries to provide data proving that timber has been harvested sustainably. This should lead not only to more sustainable management of the species, but also to more accurate trade data, and an increase in the knowledge of population sizes and trends. After a turbulent two years for tropical timber species across the world, the CITES decision is a much-needed piece of good news. The next challenge for the respective governments will be to ensure that sufficient in-country capacity is developed or strengthened to enforce the convention on the ground. Ya’axché has also welcomed the decision. Throughout the rosewood crisis, Ya’axché has made data and expertise available to the respective authorities in order to support a more sustainable approach to the use of this valuable species, as well as stepping up its own efforts to protect rosewood stocks in the Golden Stream Corridor Preserve – a private protected area owned and managed by Ya’axché. Ya’axche rangers monitoring rosewood trees during a patrol. Building on previous work in the Toledo district, Ya’axché is now embarking on a new tree conservation project supported by the Global Trees Campaign. 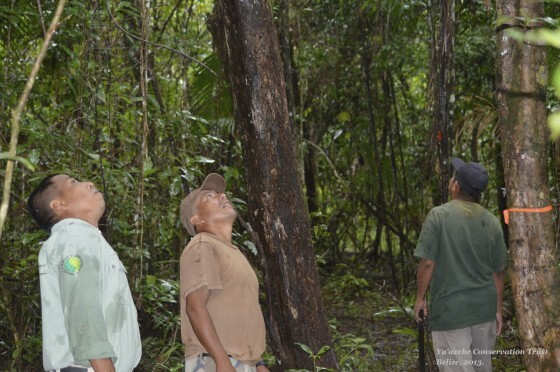 Whilst continuing to work with the Belize Forest Department in promoting a more sustainable approach to forestry, this project will build capacity to carry out targeted, well-planned conservation activities for a suite of species – including some rare and threatened non-timber trees that are already on the IUCN Red List. Gail Stott comments, “At Ya’axché, whilst we realise the importance of forestry to Belize, we think it’s crucial that forests are not simply assigned a monetary value in terms of the timber they hold. A biologically diverse forest has multiple ecological, social and cultural values. “Our new Global Trees Campaign project will help to ensure that these values are recognised – particularly among the communities of the Toledo district. We have to ensure that the people living closest to the forests understand the urgent need to preserve them. Striking a balance between conservation and sustainable development is at the core of Ya’axché’s work and is essential if we want to see the forests of Toledo not just surviving into the future, but thriving.